House train tips and tricks you really should know. Potty training your dog, whether it is a puppy, or in rarer cases, an older dog, involves pretty much the same processes. House breaking your pet is important for a myriad of reasons – hygiene, protection of flooring and furniture, and of course the smell. However, occasionally you may find yourself with an older dog that has not been house broken. Is House Training a Dog That Difficult? Perhaps the dog has learned bad habits, or had previously been kept outside, so never needed to learn to keep the house clean. With a puppy, the process is easier, because he has not had as long to learn bad habits. And the keyword here is “habit”. Get your dog into good habits and he will quickly learn what is expected. The tips below are applicable to all dogs, but remember that the process may take longer with older dogs. DON’T EXPECT YOUR DOG TO GET THE IDEA STRAIGHT AWAY! Dogs are hugely affectionate, they love to be with their owners. So, when house training you send your dog outside, he just wants to get back to you. Go out with him. With a puppy, in the early stages, you might need to take him outside a couple of times an hour, since he cannot hold much urine. PUPPY TRAINING TIP: If you’re considering getting a puppy, take careful consideration of the season when attempting to house train. If you live in a cold climate, it’s not a good idea to bring a puppy home in the winter. Spring or summer training is best – for you and the dog. In cold weather, your puppy does not want to be outside, neither will you, 5 or 6 times per day. 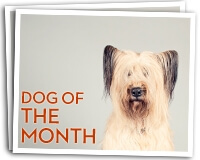 Reward your dog because you need him to associate going to the toilet outside with praise. Conversely, don’t punish him when he goes indoors. Any attention a dog gets is better than none to canine mind. Secondly, he might think that he is being punished for going to the toilet in your home. You run the risk of making him secretive about his toileting, and like a ninja, they’re hard to catch. Just like a human, your dog likes a routine. Once she is ready to toilet outside, and knows that this is the place to do so, establish timings. An older dog might need to go at the beginning of the day, on his walks, at the end of the day. A puppy will need more regular times at the outset (see tip above about when to bring a puppy home). Dogs have a digestive system just like us. He wants to eat at the same time every day to stay regular. Make sure that the food is appropriate. If it contains lots of salt, then he will drink extra, and need to urinate more often. If you leave the backdoor open, and just expect your dog to go out and toilet then he will become confused. After all, outdoors can be cold, are not always accessible (you won’t leave the back door open at night!) and might be thought of as a playground rather than an outdoor toilet. So, when you open the door, tell him to go out and tell him why. If you’re so inclined, and this takes patience, you can train your dog to ring a bell (or other noise maker) when they need to go outside. With good habits, your dog will become house trained in record time. If you spot behaviour traits that stop this – like your puppy gets excited and urinates when she greets you, then address them by making sure that a toilet stop is the first thing you do. And remember, there can be other reasons for urinating or defecating in the house. It could be a sign of stress, jealousy, marking (non neutered dog) illness or just simply old age.